Carpet Tiles are a Great Do-It-Yourself Project because they are Easy to Install. No tack strip, no kicking and stretching required. Some carpet tiles even come with a Peel & Stick adhesive system! This makes installation so quick and easy! And if a tile becomes damaged, you can effortlessly remove and replace the damaged tile with a new one without having to redo the entire floor. Our Simple Solutions I & II Carpet Tiles are made with an attached HD Cushion Back and a Peel & Stick adhesive system that makes installation quick and easy! This is a great benefit, if one becomes damaged, you can easily remove and replace the tile with a new one without removing everything from your room. Carpet tiles need no tack strip, just remove the squares from the box and install. Environmentally Friendly. 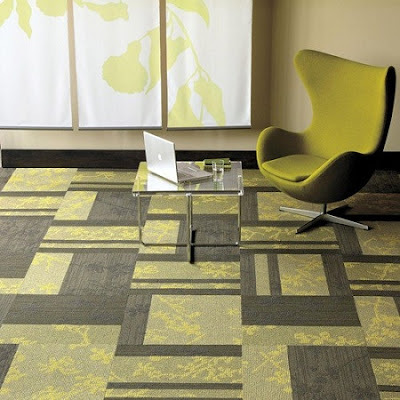 When compared to wall to wall carpet installations, carpet tiles save on average 15 to 20% on waste.